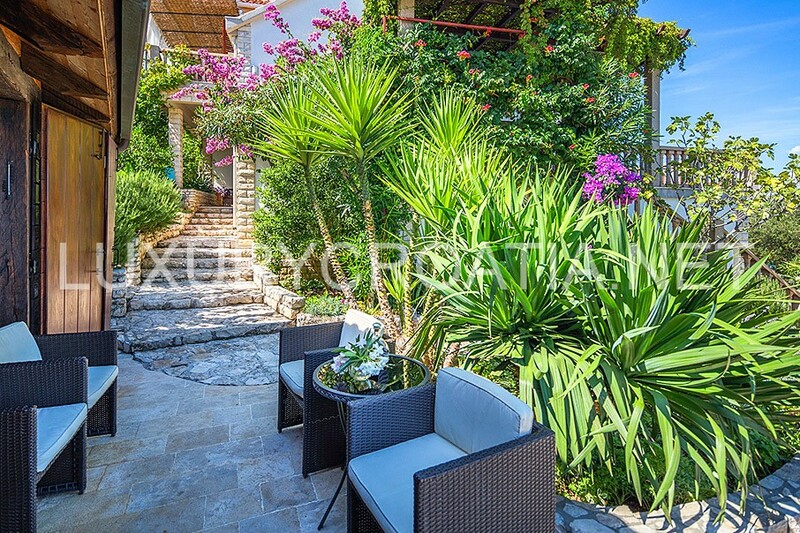 Luxury Villa for Rent, Ciovo Island provides a peaceful and tranquil holiday retreat. 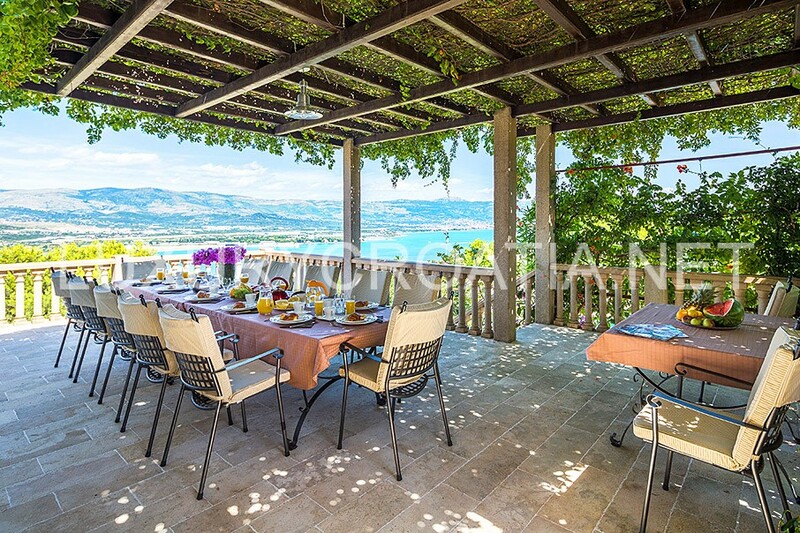 Spreading over 1000 m2, this estate offers exceptional privacy and intimacy. 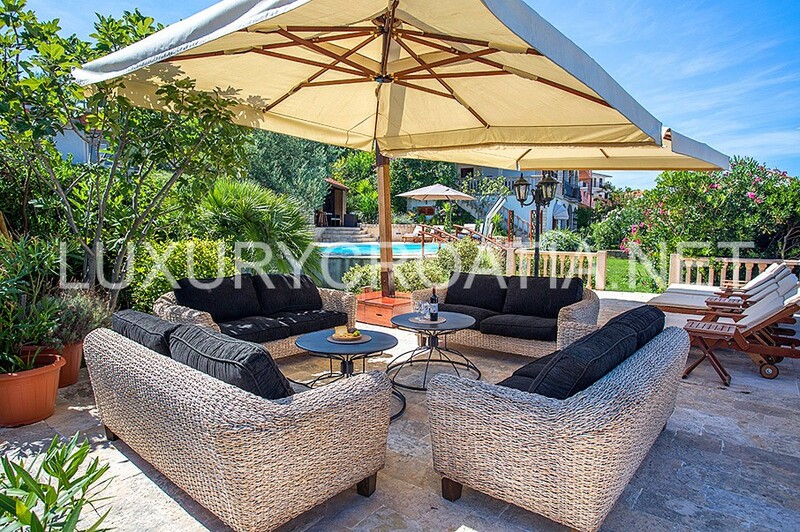 Designed with attention to detail and furnished in style with all the modern comforts you expect, the interior of the villa extends over an area of 380 m2, while its position ensures plenty of sun yet plenty of shade throughout the day, thus making it the perfect spot for your vacation. 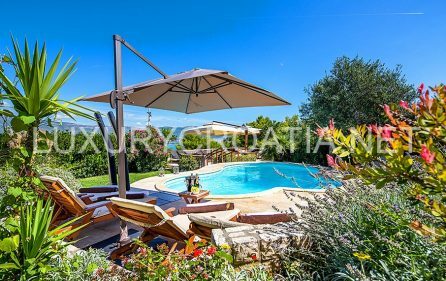 The villa is set within a beautifully landscaped spacious garden abounding with Mediterranean plants, intertwining stone pathways and spacious sunny terraces. 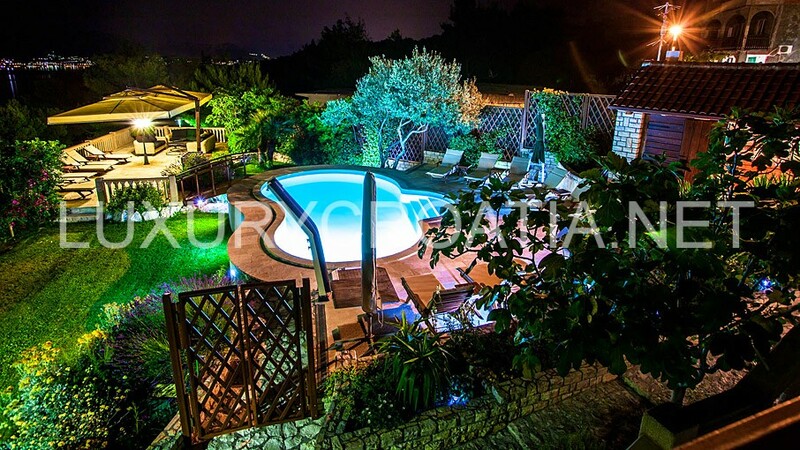 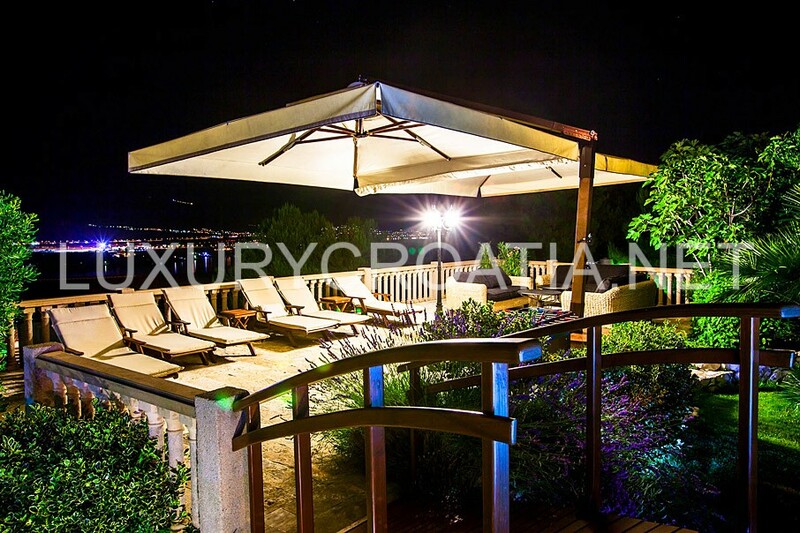 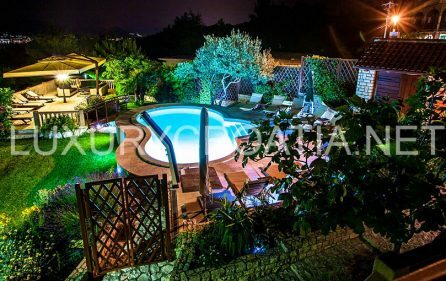 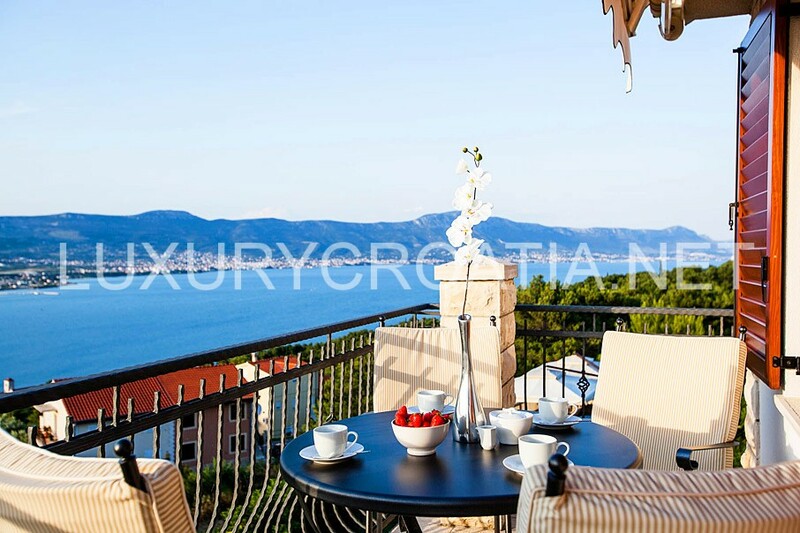 The villa boasts an outdoor pool located in the centre of the garden beside which is also the traditional Dalmatian-style konoba (tavern), where one can take pleasure in the late evening hours relaxing with a glass of wine and grilled fish, enjoying the picturesque view over Trogir and Kaštelanski zaljev (Kastel Bay). 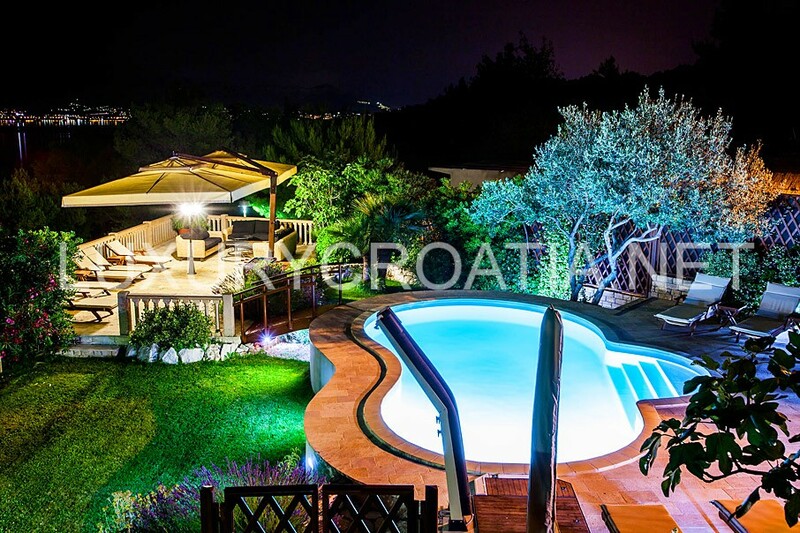 The villa also offers bicycles, table tennis, darts and tabletop football for all those wishing an active holiday. 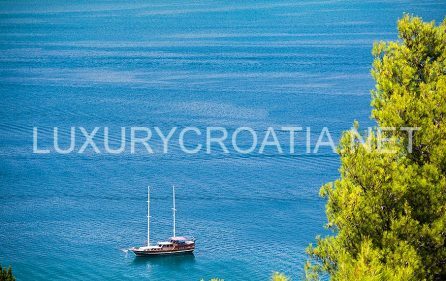 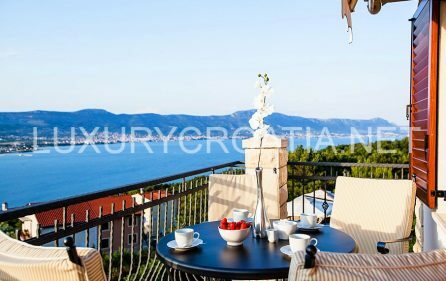 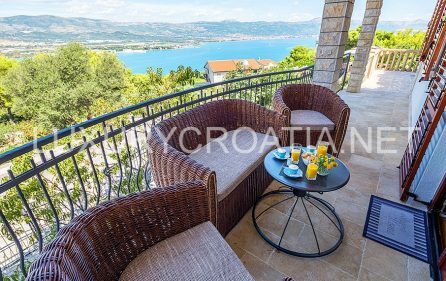 The Island of Čiovo and Trogir are the ideal location both for those who wish to relax, and for those who would rather spend their leisure time more actively, exploring and enjoying nature. 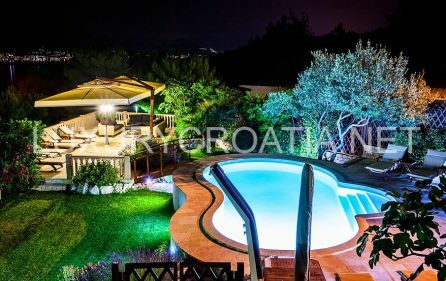 Villa is fully air-conditioned and equipped with LCD satellite TV, Hi-Fi, CD and DVD players as well as a Wi-Fi connection. 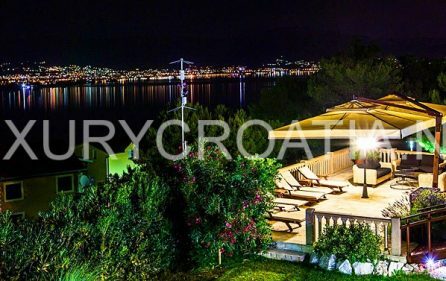 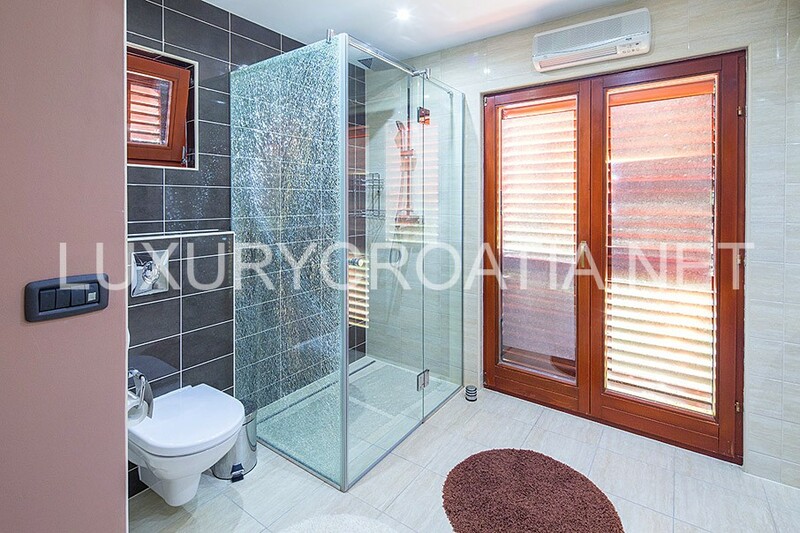 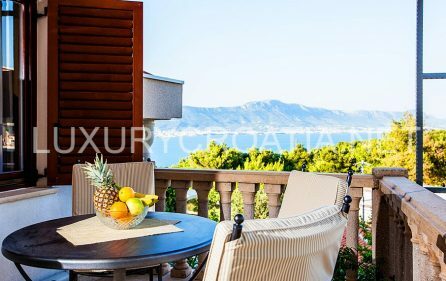 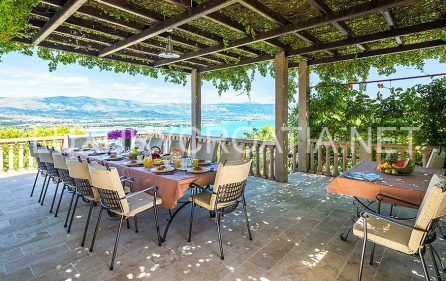 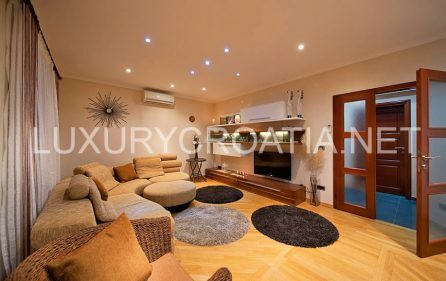 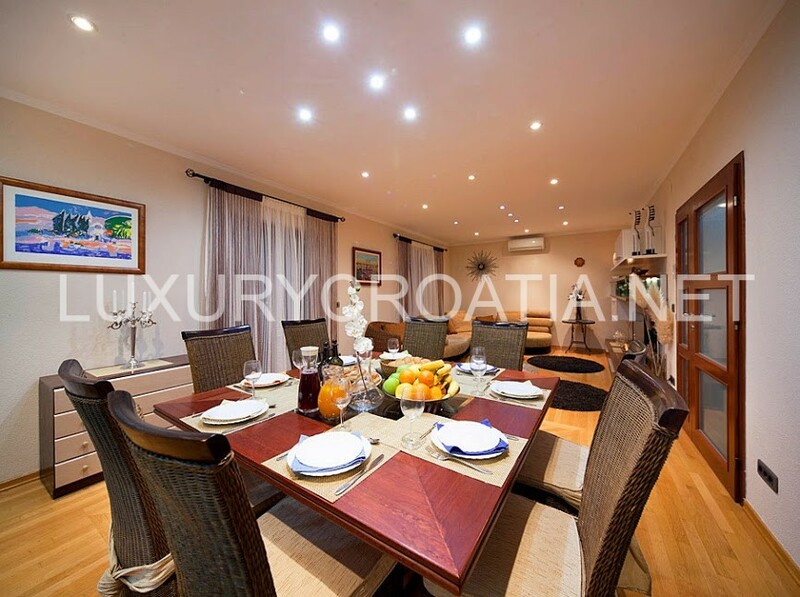 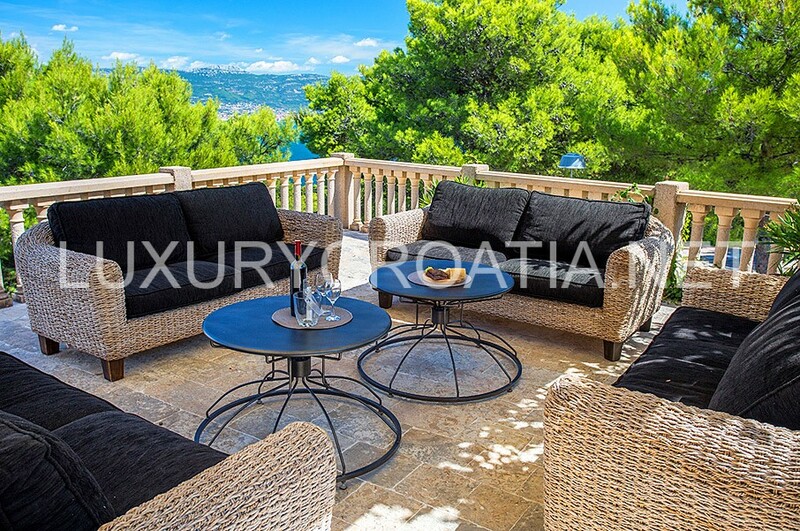 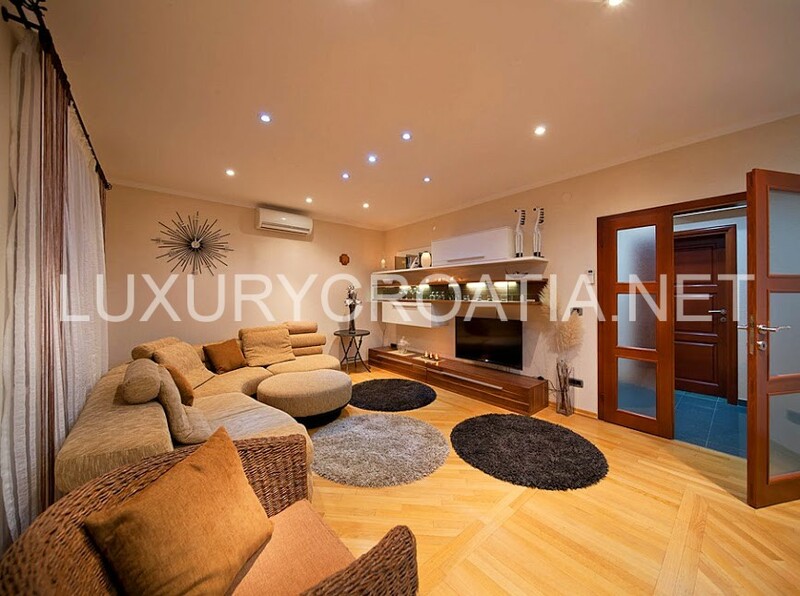 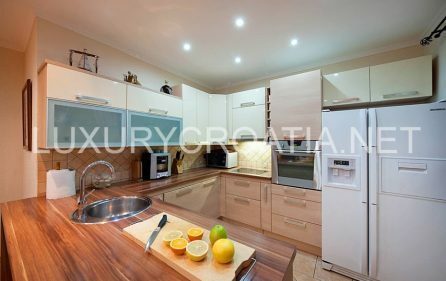 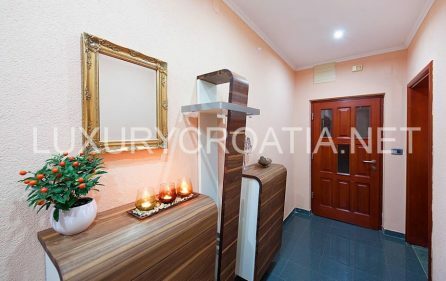 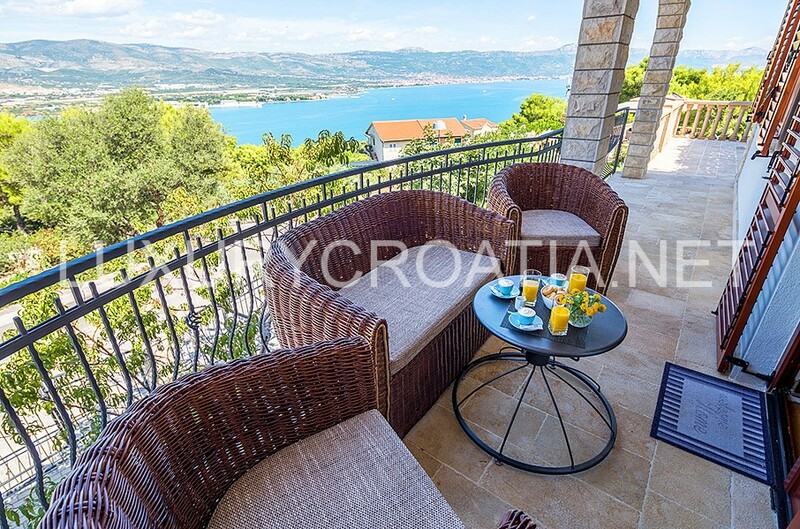 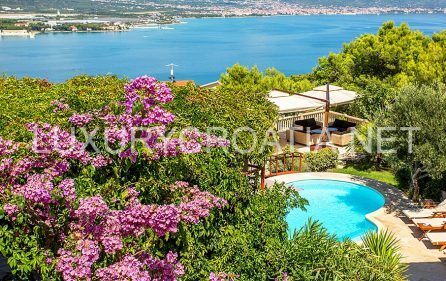 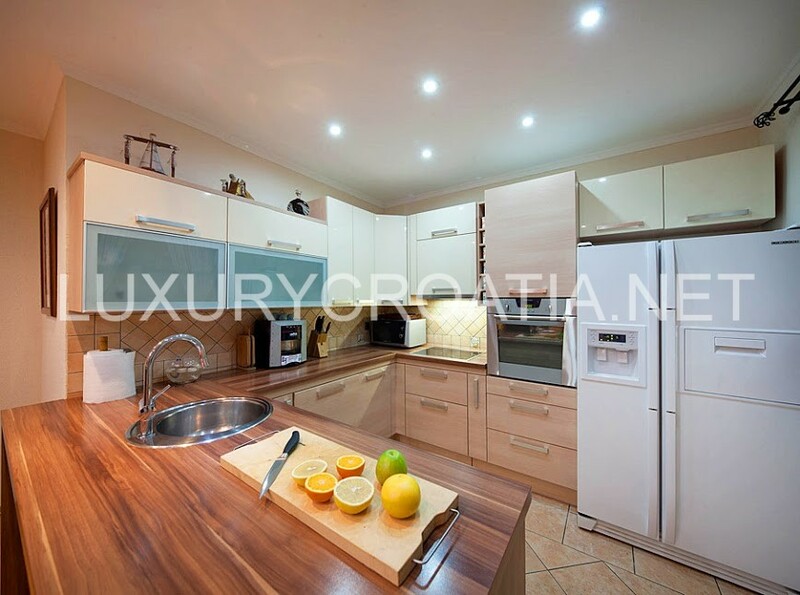 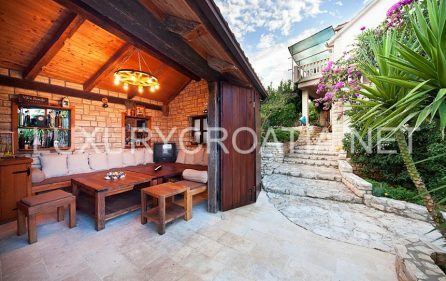 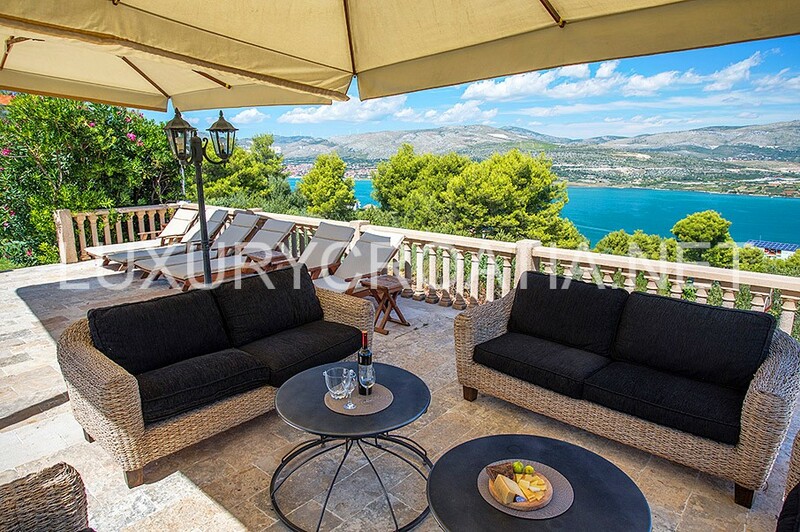 Villa is just a few minutes’ drive from the City of Trogir (3,9 km), which is included on UNESCO’s World Heritage List, and only a minute away from a beautiful pebble beach (900 m). 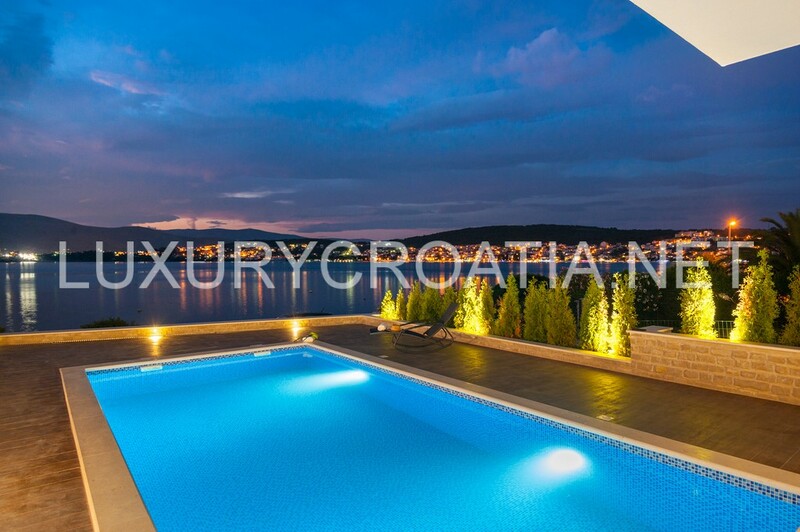 The villa is set over three floors – ground-floor, first and second floor. 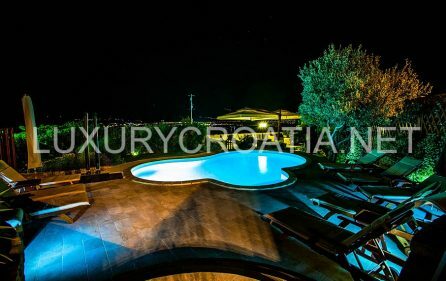 It has six bedrooms and two lofts, three kitchens, three dining-rooms, three living-rooms, five bathrooms, one toilet, a swimming pool – 32 m2, a tavern– 20 m2, private parking (3), garages (2), and can accommodate 17 persons comfortably. 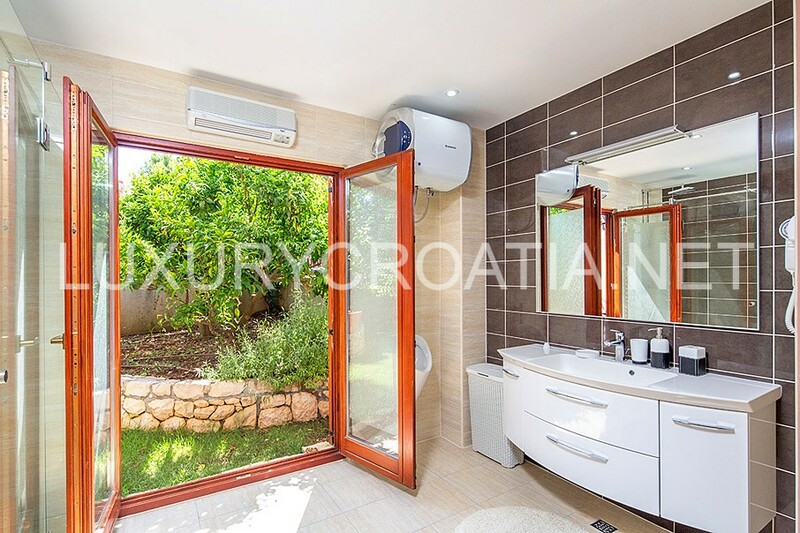 The ground-floor houses the reception and two double bedrooms with their respective en-suite bathrooms with shower cubicles. 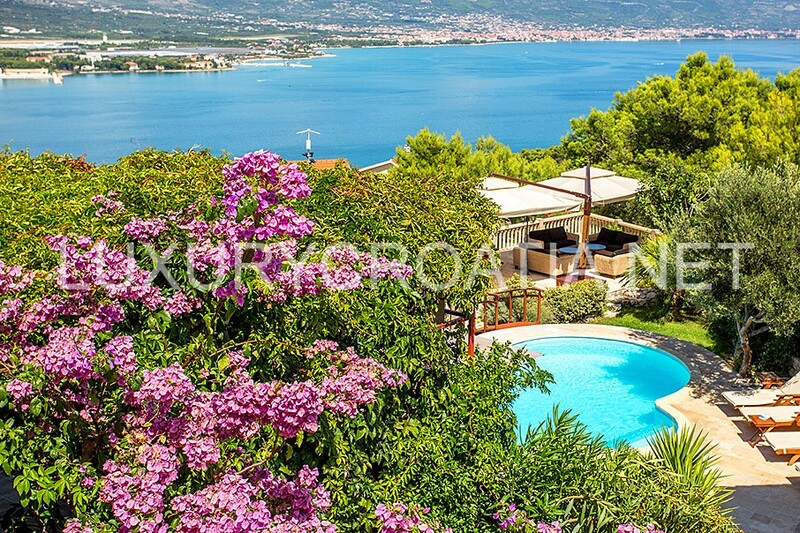 If needed, one of the rooms can be used as a guest room, while the other room is used by the villa’s housekeeper. 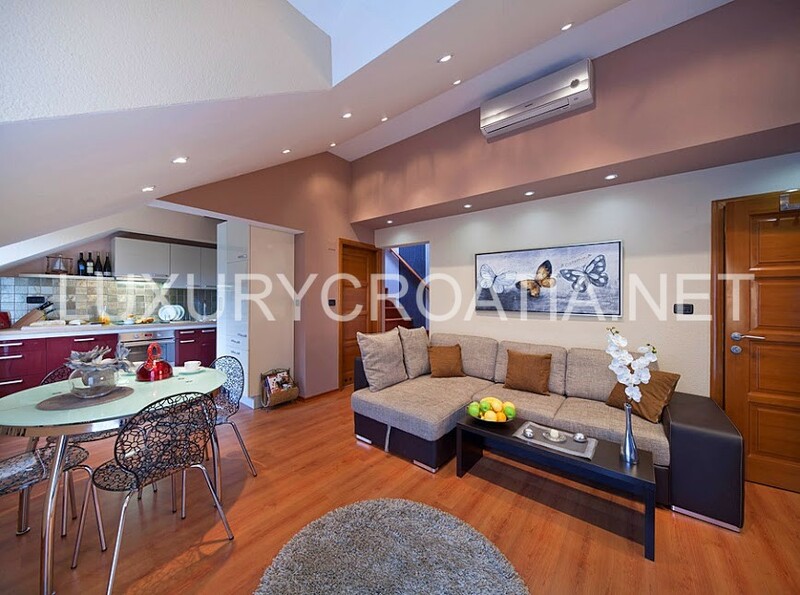 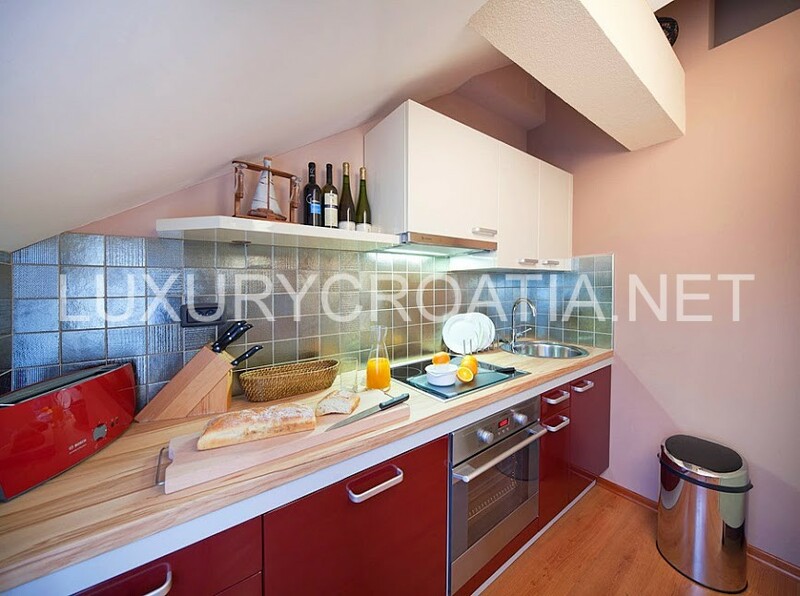 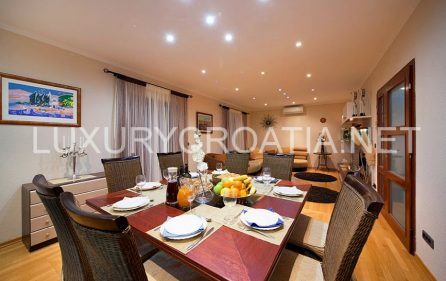 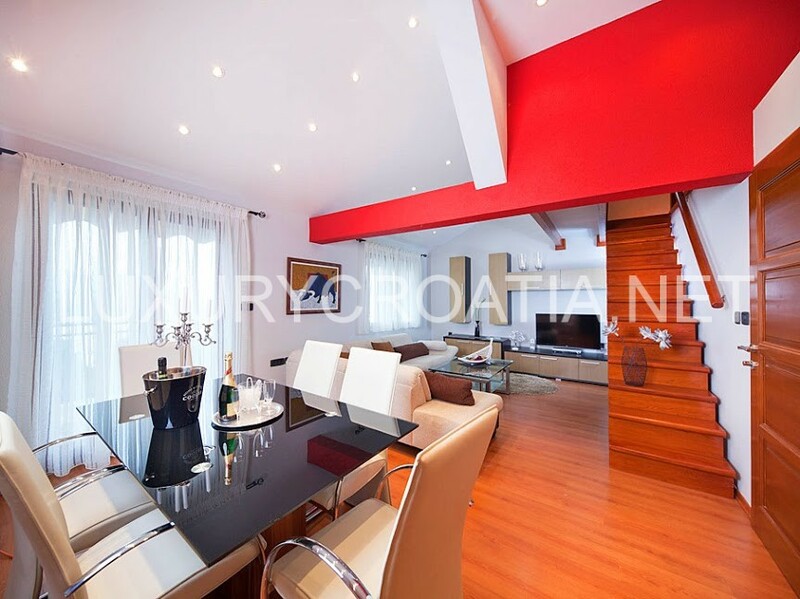 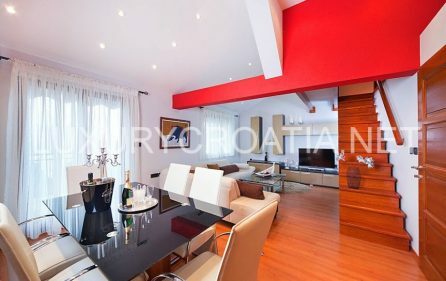 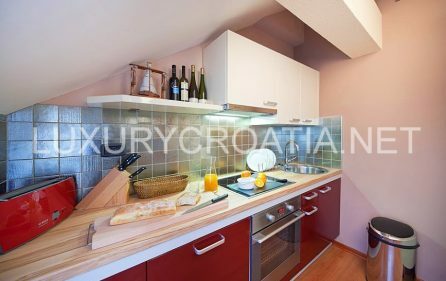 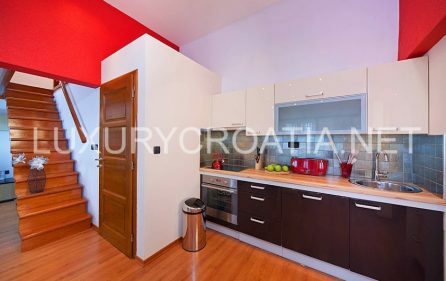 The first floor houses a spacious apartment which consists of a kitchen, dining-room, living-room, three bedrooms, a hall, two bathrooms with showers, a 45 m2 terrace and a 17 m2 balcony. 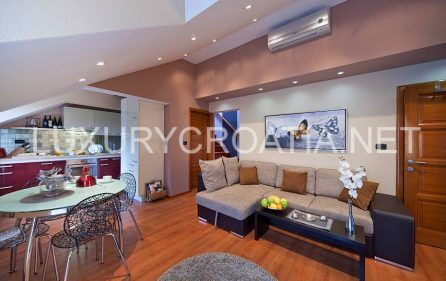 The apartment is fully air-conditioned and equipped with modern furniture as well as with the latest technology LCD TV, DVD and Wi-Fi. 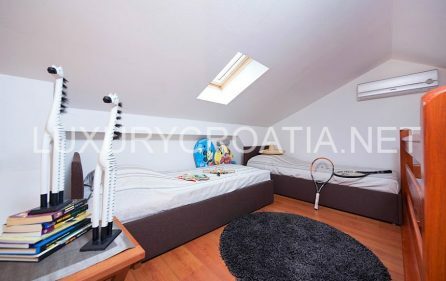 Two of the bedrooms are furnished with double beds while the third one has two single beds. 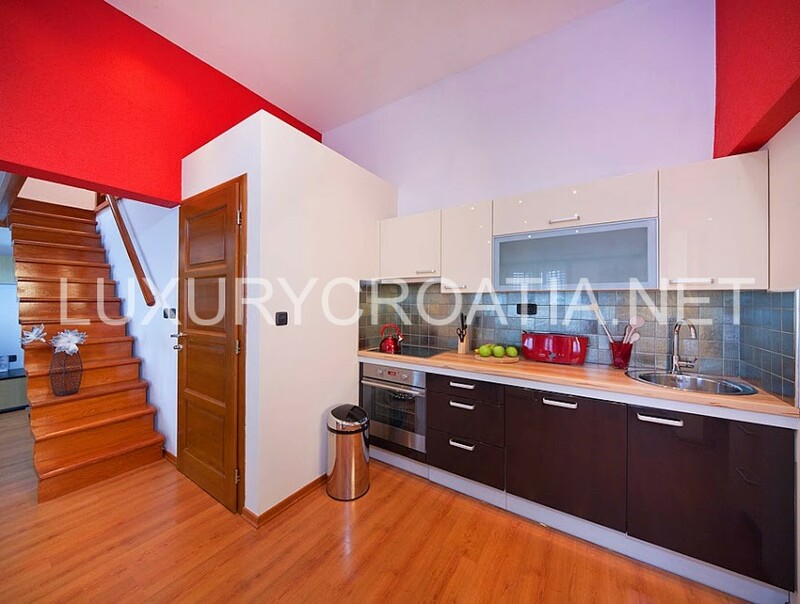 The first and the second floor are connected by a staircase which leads to 2 duplex apartments. 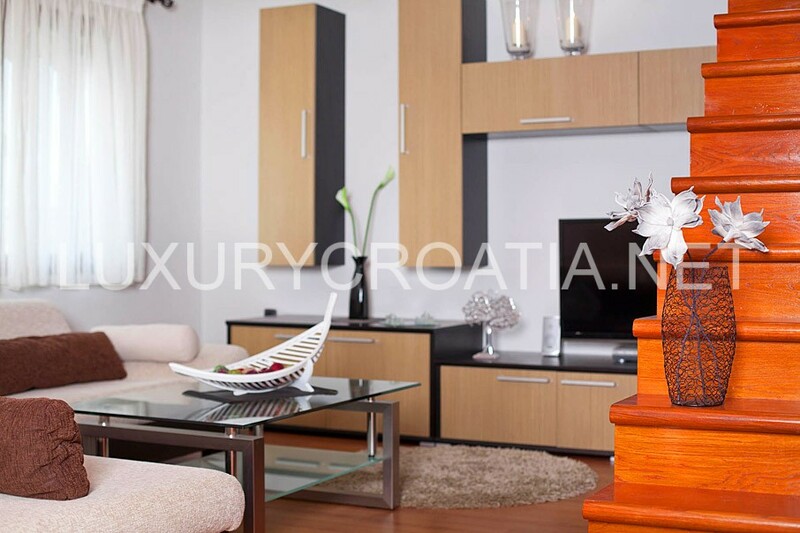 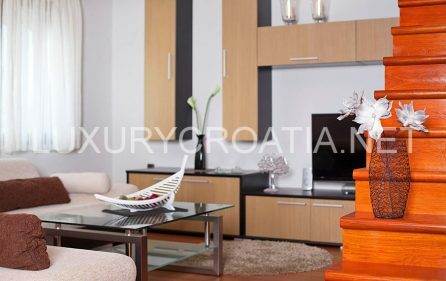 Each apartment contains a modern and fully equipped kitchen, dining- and living-room with comfortable sofas and excellent audio-visual equipment. 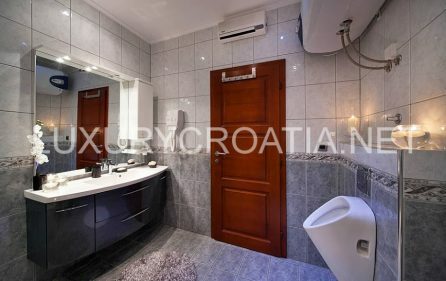 Each apartment has a bathroom with a shower cubicle, a double bedroom and a loft with two single beds. 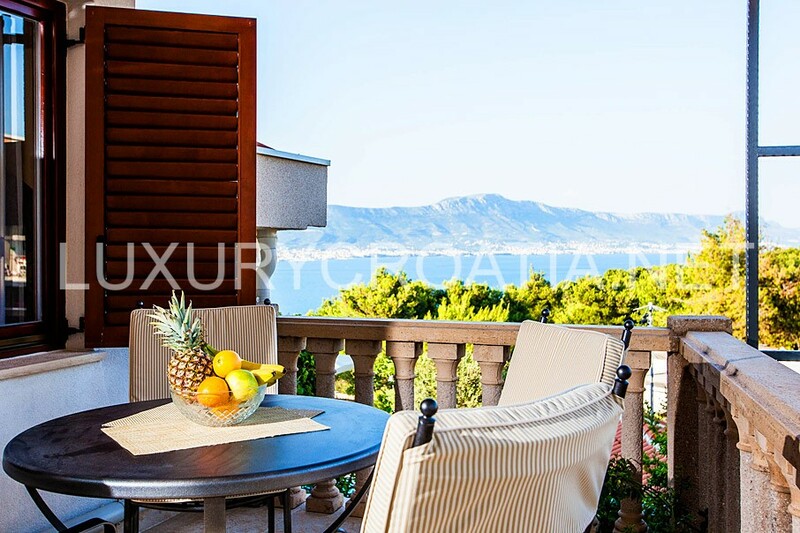 One of the apartments opens onto a 17 m2 balcony, while the other apartment extends out onto a 24 m2 terrace. 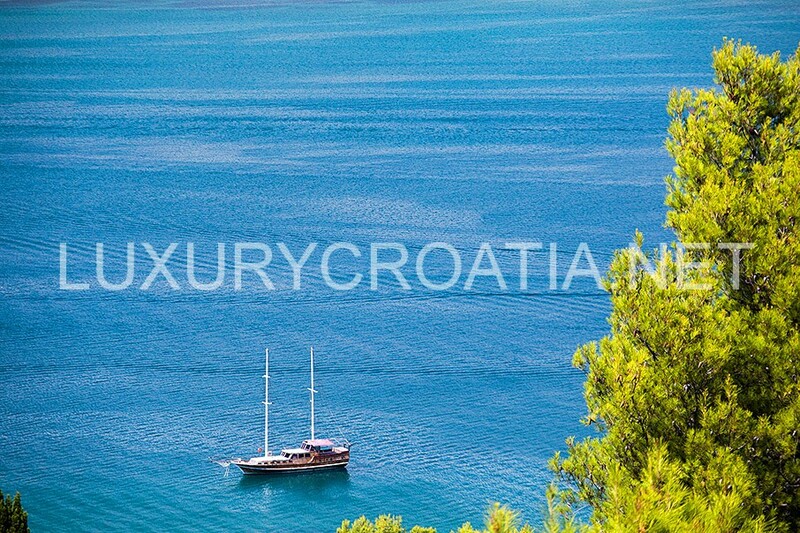 Possibility to rent a boat! 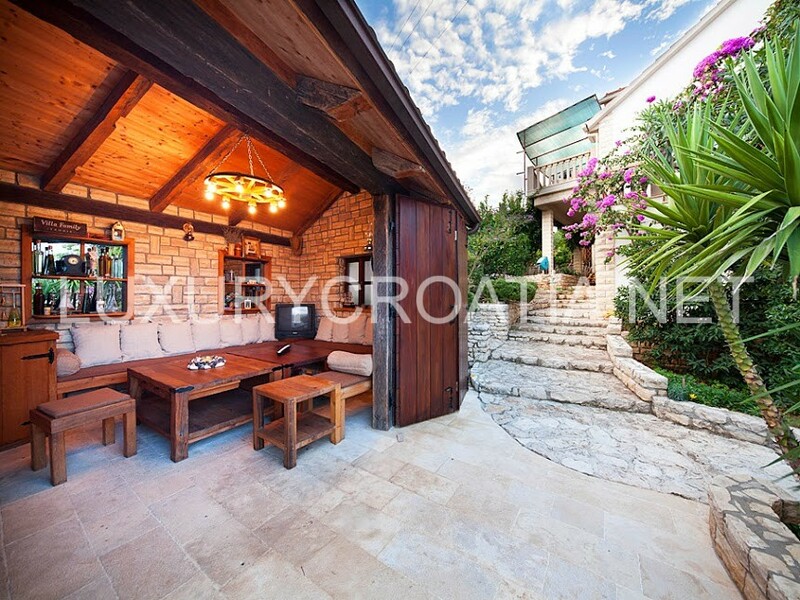 Minimunim stay in July and August is 7 days.